While we wait to see whether M/D Decorah will lay a third egg, I thought I would blog a bit about one of our other nests. The owls at Valmont, Dan and Snowflake, nest in a nest box 260 feet up a smokestack at Xcel Energy's Valmont generating station in Colorado. Owls have big wide heads that swivel almost 360 degrees, huge forward-pointing eyes that excel at gathering light, compact beaks, plump bodies, facial disks, and wing feathers with loose barbs that allow them to fly very silently. Owls swivel their heads because they can't (unlike us) move their eyes. The tufts of feathers on top of Dan's head are neither ears nor horns. Dan's ears are located under his feathers, at the side of his head, and the right ear is usually set a little higher than the left. Sounds from below reach Dan's left ear first, while sounds from above (including echoes) reach his right ear first. The difference gives him aural 'depth perception', which allows Dan to map sounds three-dimensionally. Humans don't do this very well. If I'm at a concert, I know the direction the music is coming from, but not the height of the stage the band is playing on. Is it three feet high or five feet high? I need my eyes to tell me. Dan, however, can pinpoint the exact location of the band, or his prey, just by listening. Owls swoop down on their prey from above. Dan's ability to hear and map objects in three-dimensional space helps him catch his quarry in low light, heavy brush, and under snow cover - places where eyes aren't much help. Academically speaking, owls accurately localize both the azimuth (horizontal plane) and elevation (vertical plane) of the sound source. If you like to read about geometry, sound engineering, owl hearing, or awesome stereo setups, google that last phrase. In addition to offset ears, Dan and Snowflake have facial disks. This concave collection of feathers acts somewhat like a parabolic microphone to direct sound to their ears. In the post on feathers, I mentioned that some birds use them to aid hearing. Owls and Harpy eagles both have facial disks and both hunt under limited visibility. Like other many animals that live in limited or low visibility conditions (catfish and star-nosed moles, to name two) they have developed ways to compensate. So what is Snowflake and Dan's domestic life like? She incubates the eggs and he brings the food - primarily mice, voles, rabbit, rat, and bird. Although he catches it with his talons, he always carries it in his beak. We've seen Snowflake 'incubate' prey in cold weather, presumably to keep it from freezing, but they don't larder up like the eagles do. They lay two to three round white eggs and begin incubating them immediately after laying - in theory. Snowflake does seem to spend more time off the eggs before all of them are laid. When the babies first hatch, Snowflake and Dan spend a lot of time caring for them. However, as the babies become bouncy, rambunctious 'teenagers', both parents will spend more time out on the perch. The teenage owls act a lot like Sarah, Percy, and Bill in the book 'Owl Babies' - "...and they flapped and they danced and they bounced up and down..."
Like the eagles, owls mate for life - but, like the eagles, mates that die will be replaced. Owls are very territorial and will defend their territory against intruders. Several years ago, the nest box at Valmont was invaded by a strange owl. The two females fought quite viciously before one of them - we think the intruder - was vanquished. Dan and Snowflake have also driven off ravens, which can interrupt nesting, and incubated eggs through thick snowfall and icy rain. Like Bald eagles, they are well adapted to cold weather: they even have feather feet to help protect against cold weather and possibly to sense prey. It was hard not to feel sympathy and concern for Mom last night as she lay in the nest after egg #2, rapidly disappearing under a blanket of snow. Fortunately, she had roughly 7,000 feathers to protect her from the weather. Different sources provide different answers about how many things birds do with their feathers, but all of them agree that insulation is important. The snow piling up on Mom's back last night provided a clear picture of the insulative properties of feathers: Mom wasn't losing enough heat to melt the snow away from her back. I wish my roof was so efficient. 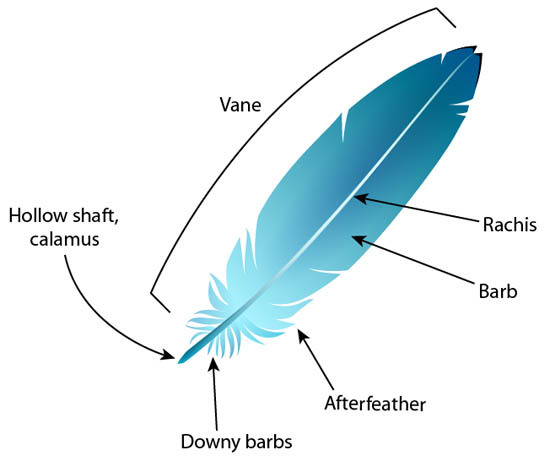 There are two basic types of feather: vane feathers, which cover the birds exterior, and down feathers - looser, fluffier feathers underneath the vane feather. All true feathers are branched: they have a central rachis with rows of barbs on either side. However, down remains light and fluffy, which traps air and helps insulate the bird, while flight feathers hook together like a zipper, to form a continuous 'vane'. Personally, I think of it as dressing in layers: the vane feathers form a sort of 'overcoat' underlain by the soft, insulative down feathers. Given that snow also has insulative properties, Mom was quite warm and cozy under her blanket. So how else do birds use their feathers? According to 'Ask A Biologist', they help birds fly, keep warm, control body temperature, provide weather protection, aid in swimming, diving and floating (waterbirds and piscivorous birds), snowshoe (Ruffed grouse), toboggan (penguins), brace, feel, hearing (owls, harpy eagles), making sounds, muffling sounds (owls), foraging, keeping clean, aiding digestion, constructing nests, transporting water, escaping from predators, sending visual signals, and camouflage. I think I'm jealous! 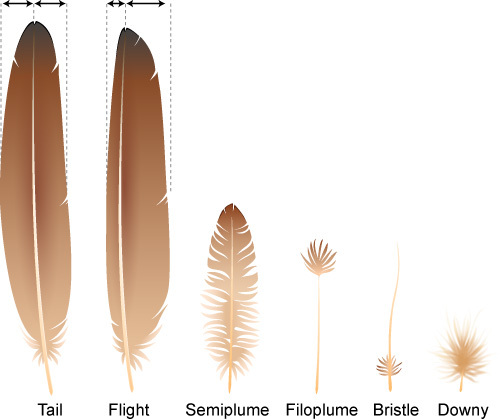 Since feathers do so many things, it is unsurprising that they come in more than one type. The feathers we find dropped in the woods most often are tail and flight feathers. They seem the same but are actually a little bit different. Tail feathers are balanced evenly left and right of the rachis, while flight feathers have a wider and narrower side. This helps them cut through the air with very little drag. Of course, wing shape also influences flight, but that is for another post. The downy feathers that are good for warmth are shown on the far right. Semiplume feathers are also insulative and help water birds float (although some diving birds are more concerned with going deep - their feathers become waterlogged to help them sink). We think the bristle feathers, found around eyes, nostrils, and sometimes the mouth, help protect those sensitive areas. Filoplume feathers are can be found around the tail and flight feathers. They are thought to be used to sense when the flight feathers need to be maintained. Although feathers seem light, all of them put together weigh roughly two or three times more than a bird's skeleton does. They also require a lot of maintenance. Most birds have a preen gland near their tails. This gland secretes oil which they spread over their feathers with their beaks. Preening helps remove dust, dirt and parasites from feathers and also aligns them properly. Even with care, feathers eventually begin to suffer damage and must be replaced through molting - an itchy-looking process that renders some birds (but not eagles) flightless. However, the benefits of feathers - flight, protection, insulation, display - far outweigh their costs. We sleep warm in our beds with the benefit of furnaces and blankets. All Mom and Dad need are their feathers. 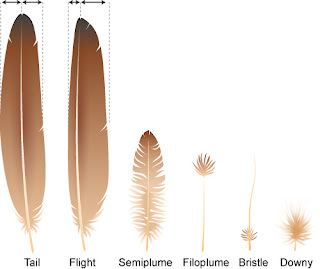 For more information on feathers, I suggest this website: http://askabiologist.asu.edu/explore/feather-biology. I also took some information from Colin Tudge's book The Bird. There are two ways to think about this: from egg laying to hatch, and from pip to hatch. From egg-laying to hatch: Most experts say 35 days, give or take a few. It took the Decorah Eagles 37 days in 2009 and 2011, and 36 days in 2010. 35 to 37 days is a safe bet. The eagles hatched all of their eggs in 2009, 2010, and 2011; however, fertilized eggs can fail to develop due to extreme cold, soft shells, or microorganisms. We are hopeful they will have another great year, but we won't know until it happens. In northern climates, Bald eagles lay eggs when it is still quite cold. They begin incubating immediately after the first egg to prevent the egg from freezing. The eggs hatch the same order and roughly the same interval in which they were laid. While the eaglets are still young, it is possible to identify hatchling number one by its size: it is older and therefore bigger than its nest mates. As the eaglets grow, this difference disappears. Does Dad help incubate the eggs? Based on our observations of the Decorah eagles, yes! Before all of the eggs are laid, Mom spends most of the time incubating and laying eggs. Once she is done, Dad incubates about 50% of the time. Having said that, other nests have reported different divisions of labor, with Mom spending much more time incubating than Dad. We don't know why the eagles act differently from nest to nest, but they do. Oh no! The eagles aren't sitting on their eggs! Caring for eggs is a serious business. Everyone knows that eggs shouldn't get too cold, but they also can't get too hot, or the embryos will die. The adults sit on the eggs when they need heat and get off them when they need to be cooled. In particular, the Decorah Bald eagles lay eggs and care for nestlings in late winter and early spring, so their challenges include snow storms, ice, and rain. These things can be frightening to us, but Bald eagles have been coping with them for tens of thousands of years. It is okay for the adults to spend some time off their eggs. The adult eagle also turn their eggs regularly. Turning the eggs helps keep them all at the same temperature and prevents the babies from sticking to the insides of the eggshells. What do Bald eagle eggs look like, and how large are they? Bald eagles lay white, oval shaped eggs. The eggs weigh approximately 125 grams or 4.4 ounces, and are on average about 2.9 inches long and 2.2 inches wide. Size-wise, they are just a tad smaller than a tennis ball, although tennis balls are round, not oval. What causes the egg to hatch? Mom and Dad Bald eagle apply heat through incubation, which causes the embryo to grow. At a certain point, it penetrates the air cell - that white sack-like membrane that can also be seen in chicken eggs - and its egg tooth penetrates the shell, creating a hole or pip. It usually hatches 24 to 48 hours after first pip. The yolk of the egg is absorbed into the baby's stomach at this point, which gives it the energy it needs to hatch. A brood patch is a bare spot where feathers are missing. Hormonal changes linked to reproduction cause feathers to fall out, which creates a bare patch of skin that allows the incubating bird to better transfer heat to the eggs. Bob estimates that a Bald eagle's skin temperature is about 101F. Some Bald eagles develop brood patches and some don't. We have not seen a developed brood patch on any of the three adult eagles we have monitored in Decorah, and they all incubated their eggs successfully. Do Mom and Dad mate for life? Yes, but if one eagle dies, another eagle will replace it. We are coming into our busy season! The Fort St. Vrain Bald Eagles laid their first egg yesterday - the same day they laid egg #1 last year. If the Decorah eagles do the same, we won't see an egg there until February 23rd. Note the size difference between Dad (top left) and Mom (lower right). Mom is clearly much bigger than Dad. 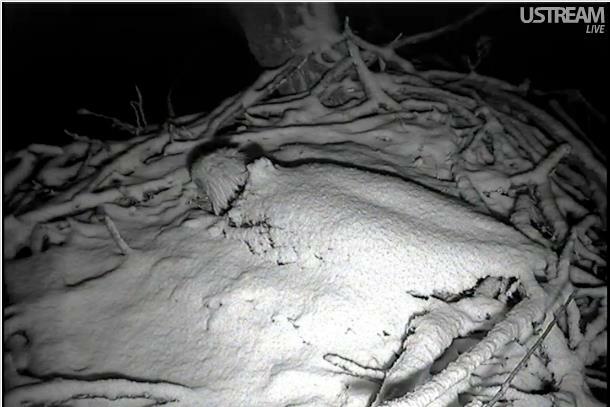 The Valmont Great Horned Owls laid their first egg on 2/13/12: 8 days earlier this year. Snowflake and Dan are already on egg #2. Here, Dan brings Snowflake a nice mouse. Watchers probably remember some owl scares last year as well. This is scary for us, but life as usual for the eagles. Thanks for the photo caps and dates - they are very helpful in tracking important dates!